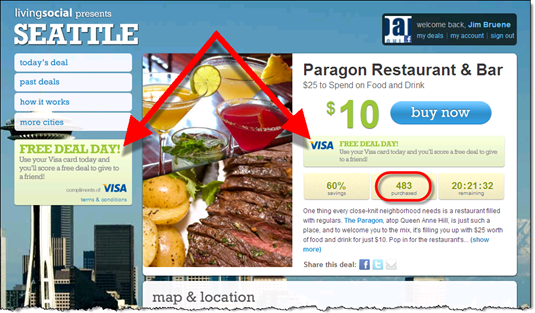 In my post yesterday about flash marketing via Groupon and LivingSocial, I neglected to mention another interesting opportunity: working directly with the marketing companies to add your brand to the service. Because payments and credit are crucial to ecommerce success, financial brands are a logical addition to the checkout process. 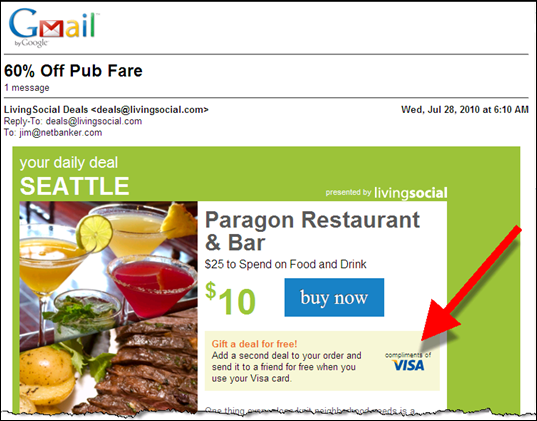 And Visa just so happens to be featured today at LivingSocial (see inset and screenshots below). Anyone who buys today’s Seattle deal, a $25 restaurant certificate for $10, automatically gets a second certificate to use as a gift, if they pay by Visa Signature card (see notes 1, 2). It’s hard to say what Visa is paying for the promotion, but given the massive website traffic and transaction activity, it’s likely a pricey sponsorship (note 3). 2. My saved credit card in the site is a MasterCard; when I went to purchase the deal, there was no mention of the free certificate, nor any prompt to switch to Visa. 3. The merchant is receiving $5 for each certificate issued under the main deal. Visa’s sponsorship would need to cover some compensation to the merchant, but perhaps at less than $5 each, since fewer of the gifted certificates will be redeemed. It looks to be a popular offer, having sold almost 2,600 units (by 7 PM), with almost 10 hours remaining.